Published: May 11, 2015 at 05:38 p.m. Updated: May 12, 2015 at 06:53 p.m. The Patriots will begin their Super Bowl title defense without the services of the franchise's all-time greatest player. The NFL announced Monday that Tom Brady has been suspended without pay for four games for violating the NFL policy on the integrity of the game. The team will also be fined $1 million and will forfeit a 2016 first-rounder and 2017 fourth-round selection in the NFL Draft. Brady's agent announced Monday that his client will appeal the suspension. How do fines get determined in the NFL? Is Jimmy Garoppolo ready to carry the Patriots? Patriots owner Robert Kraft came out strong in opposition to the punishment. "Despite our conviction that there was no tampering with footballs, it was our intention to accept any discipline levied by the league," Kraft said. "Today's punishment, however, far exceeded any reasonable expectation. It was based completely on circumstantial rather than hard or conclusive evidence." 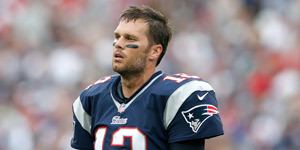 Commissioner Roger Goodell authorized the discipline that was imposed by NFL Executive Vice President Troy Vincent, who made it clear that Brady's lack of cooperation with the league's investigation was a factor in the punishment. "The report documents your failure to cooperate fully and candidly with the investigation, including by refusing to produce any relevant electronic evidence (emails, texts, etc. ), despite being offered extraordinary safeguards by the investigators to protect unrelated personal information, and by providing testimony that the report concludes was not plausible and contradicted by other evidence," Vincent wrote to Brady. Vincent cited the Patriots' prior record when determining the discipline, specifically their violations while videotaping other teams' signals in 2007. Brady wasn't the only one punished. "Patriots owner Robert Kraft advised Commissioner Roger Goodell last week that Patriots employees John Jastremski and James McNally have been indefinitely suspended without pay by the club, effective on May 6th. Neither of these individuals may be reinstated without the prior approval of NFL Executive Vice President of Football Operations Troy Vincent," the league's statement reads. The Patriots have played without Brady before, going 11-5 after Brady tore his ACL in Week 1 of the 2008 season. Last year's second-round pick Jimmy Garoppolo will be expected to get the starting nod against the Pittsburgh Steelers when the season gets underway on Sept. 10. Brady will return when the Patriots take on the Colts in Week 6 on Sunday Night Football. You can't make this stuff up. Kraft commented on the matter last week, saying his team "had done nothing inappropriate in this process or in violation of the NFL rules." He indicated, however, the team would accept any punishment the league hands down. The league's statement went out of its way to say that coach Bill Belichick and the rest of the Patriots staff were unaware of any wrongdoing. The story first became a national topic in the buildup to Super Bowl XLIX. Both Brady and Belichick vehemently denied doing anything to the footballs before the game against the Colts. "At no time was there any intent -- whatsoever -- to try and compromise the integrity of the game," Belichick said back in January. "I believe now, 100 percent, that I have personally and (the Patriots) have absolutely followed every rule to the letter." The latest Around The NFL Podcast reacts to the most recent developments in the Tom Brady suspension saga and makes rookie predictions for the 2015 season. Find more Around The NFL content on NFL NOW.